The issue includes perspectives from youth activists, a classroom teacher, a former urban superintendent, a community organizer, university researchers, policy experts, and leaders supporting municipal government and educational philanthropy. 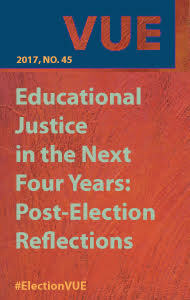 We hope that these voices provide hope, inspiration, and concrete strategies for advancing educational justice in the next four years. Several members of AISR's program staff offer their thoughts about moving forward after the 2016 election.